An investigation by Quebec’s workplace health and safety board into a deadly explosion at the Neptune Technologies and Bioresources plant near Sherbrooke in 2012 has found the company to be at fault. 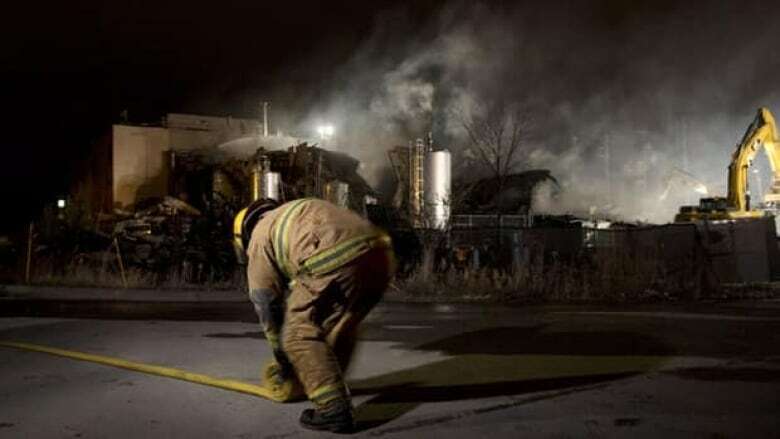 An investigation by Quebec’s workplace health and safety board, or CSST, into a deadly explosion at the Neptune Technologies and Bioresources plant near Sherbrooke in 2012 has found the company to be at fault. The findings of the CSST investigation into the November 2012 explosion that killed three people and left 34 suffering physical and psychological injuries as a result of the incident were made public Thursday morning. The investigation found three principal causes for the accident. One was shortcomings in the design and control of chemical processes connected to the extraction of krill oil at the plant that resulted in the uncontrolled release of acetone and the explosion. CSST inspector Robert Beaudette said there had been previous acetone spills at the Neptune facility in the months leading up the explosion. "It's not surprising that this accident happened," he said. The report also found contradictions between the building’s classification and its principal use as well as deficiencies in the company’s management of health and safety issues. Investigators found many workers were not aware of the risks associated with what they were doing, and they were not trained for an emergency. Many workers also didn't know how to evacuate the building, inspectors said. Beaudette said the blast could potentially have been avoided if some of the problems had been fixed or if a risk assessment had been carried out. "If the employer's obligation had been respected it would have made it quite easily avoidable, absolutely," he said. The commission said Neptune Technologies and Bioresources faces a fine of between $15,420 and $61,680. Production of krill oil at the Neptune plant will only be allowed to resume once the company meets a number conditions. These include a risk analysis of its chemical controls and procedures and improved emergency measures and employee training on the handling of hazardous materials. A press release issued by Neptune Thursday said the company hopes to resume operations early next month.